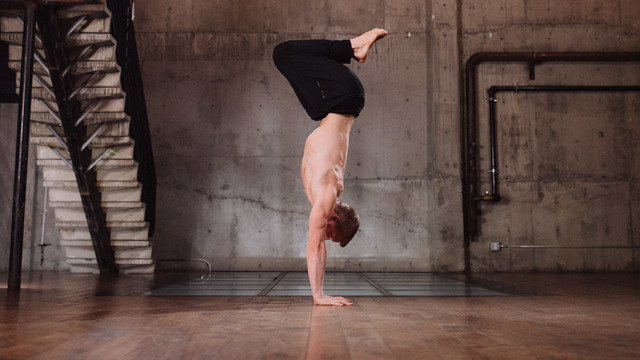 Whether you are just starting to explore handstands, or are an advanced handstand practitioner, this series will build your skills, strength and confidence. Each of these 15 easy-to-follow sessions can help you improve your technique and build the physical and mental strength you need to find balance upside down and hold your inversions. From hip mobility to handstand pushups, Carson built this program so yogis can follow it sequentially or jump from class to class. These 10-minute videos include wrist warm-ups, wall drills, stability challenges, and more. As you move through these tutorials, you will explore how to safely fall in and out of inversions, improve your body and breath control, and smile in your practice. This is a 9-minute preview of Carson Calhoun's Handstand Tips & Conditioning series. Before any handstand practice, you have to warm up. This lesson gives you a complete shoulder and wrist warm up to get you ready to stand on your hands. If you can’t breathe, you can’t handstand for long! In this class, you will learn how to breathe when entering handstand and to use your breath to stay upside-down. Grab your mat and find a safe wall by which you can practice kicking up into handstands today! Wall negatives will help you use gravity to build strength! Grab a mat and find a safe while that you can practice against.